You'll love these cheesy yet healthy enchiladas! You'll love these cheesy yet healthy enchiladas! I love Mexican food, especially Chevy's Fresh Mex. I often order cheese enchiladas--oh so yummy, but oh so full of grease and fat! 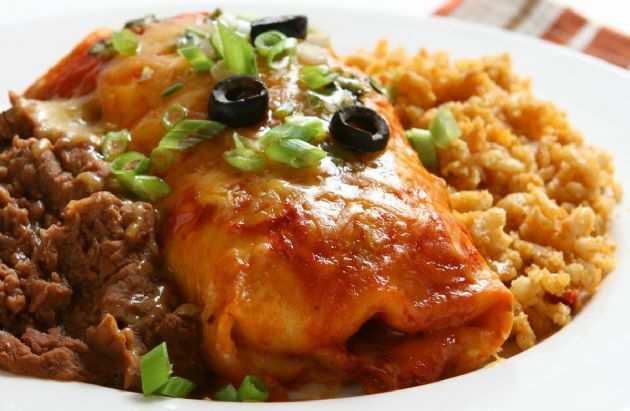 Their enchiladas contain between 230-290 calories and 10-27 grams of fat PER ENCHILADA! This guilt-free version is quick and easy and satisfies even the most discerning cheese lovers in our family. They look really cheesy, with 1/2 cup of cheese on top, but looks can be deceiving. The filling is tasty and lower-fat, and the tortillas are softened in the microwave, reducing the fat and calories even further. Soften the tortillas. Normally, tortillas are softened by lightly frying them in hot oil. Skinny enchiladas skips this step...and all the fat! Pour the enchilada sauce in a skillet and heat. Dip each tortilla in the hot sauce, coating each side, for a few seconds. Shake off and place on microwavable platter, 3 or 4 at a time, making sure that they do not overlap. Microwave for 20-40 seconds, until soft. (Time will vary according to your microwave oven.) Set aside to cool. In a bowl, mix 3/4 cup finely chopped onion (about 1/2 a large onion), ricotta, cottage cheese, green chiles (mild or hot, to taste), and salt and pepper to taste. Add half the shredded cheese (1/2 cup.) Mix with fork until ingredients are blended. Spray a rectangular casserole dish with non-stick spray. Place approximately 1/12th of the cheese mixture (about 1/4 cup) on a tortilla and loosely roll. Place seam side down in casserole dish. Repeat until all tortillas are filled. Spread remaining enchilada sauce evenly over the enchiladas. Bake for 15 minutes in an oven preheated to 350 degrees Fahrenheit. After 15 minutes, remove and evenly spread the remaining cheese and the black olives on top. Return to oven for 10 more minutes. Garnish with green onions (optional) and serve hot.